We all know the tragic end of Margaret Pole, Countess of Salisbury. 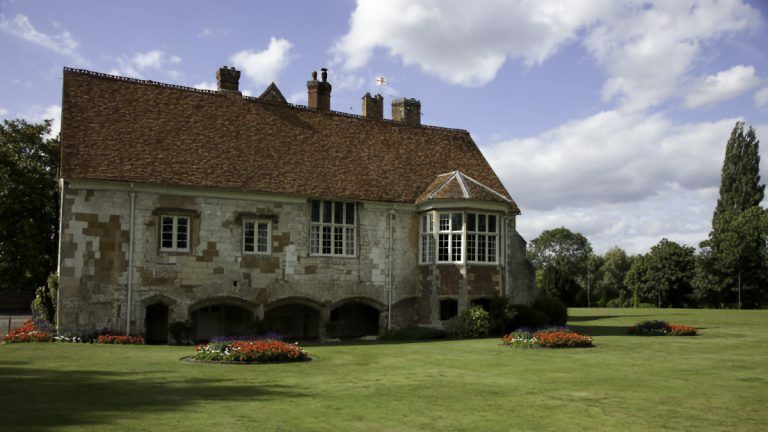 If you are new to Tudor history I’d highly recommend reading the guest article by Alan Freer called, “The Last Plantagenet” to get yourself better acquainted with her life, and grizzly execution. Margaret was the daughter of George Plantagenet, Duke of Clarence. George was the brother of both King Edward IV and Richard III. 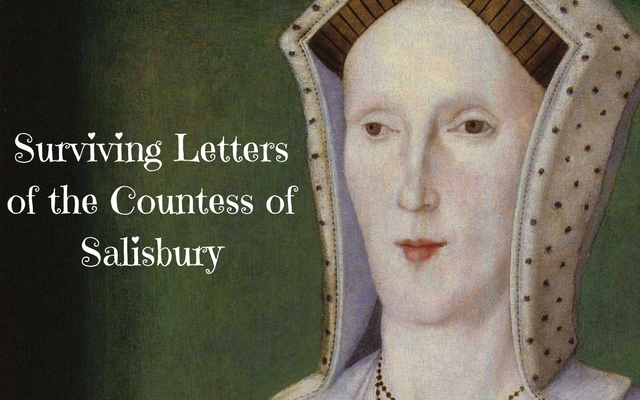 This letter is written by Margaret Pole, Countess of Salisbury to her first cousin, Arthur Plantagenet, the illegitimate son of King Edward IV Lord Lisle in Calais. It was written sometime between 1533-1538; I’m able to determine that since Arthur became Lord Lisle in 1533 and Margaret was arrested and imprisoned in 1538 – she did not write this letter from the Tower of London. It appears to be mostly pleasantries between two cousins and some discussion about a Robert Baker that Margaret appears to know and Lord Lisle appointed him into the King’s service in Calais. In my hearty manner I recommend me unto you, and to my lady your wife, being glad to hear of your good health; praying you, that where my friend Richard Baker is by your favor appointed to the king’s service in Calais, it may please you to be good lord unto him, and the rather for my sake, in all such things as you may do him favour therein; for I doubt not but that you shall find him an honest man, and meet to do the king service. And thus I pray Jesu preserve you in good health, and prosperous to His pleasure. At Bysham, the 6th day of March. Here is another correspondence between Margaret and her son, Reginald from July 1536 – this is the only other letter that I’m aware of that survives. The letter was a heavily damaged copy and you’ll notice the areas that were unreadable. I included his letter so you could her interaction with her son. Most humbly desiring your ladyship’s blessing. And, Madam, I doubt [not] but your ladyship continually desiring my com[ing ho]me, and speciall[y] at this time, having firm [ho]pe that it should [in] a few days come to pass [th]at you should [see] me there presently, as the b[ea]rer hereof, my [ser]vant, did inform me to be your w[or]ds at his departing from your ladyship, tru[st]ing that he was sent for that purpose to bri[ng] me home; now that my return doth not fo[llow] according to your expectation, the more, I doubt not, greve it woll be to you, and marvel both, that I do not come.” Must put her, however, in remembrance of her old promise to God touching him from his childish years, “that ever you had given me utterly unto God. And though you had so done with all your children, yet in me you had so given all right from you and possession utterly of me that you never took any care to provide for my living nor otherwise, as you did for other, but committed all to God, to whom you had given me. This promise now, Madam, in my [Maister]es name I require of you to maintain, [the wh]iche you cannot keep nor make good if y[ou] now beginne to care for me. Whan you see [me] . . . . . . . complayne of my Maistre, [th]an were [it] tyme for you to care for me; b[ut] afore [that] tyme you do God wrong if y[ou] . . . . . . . . . wiche cannot be without a certa[yne doubt] of the provident favor of Him towa[rds me to] whom you have given me. Therefore . . . . . Madam, let not this injurie be ever found [in y]ou towards my Master and yours both, specially . . . eng this testimony of me the servant, that [I ha]d never cause in my life to make the . . . . complaint, being, in comparison, infinitely [better] provided for in all parties than I was [worthi]e or could desire, never feeling from [child]wod, syns that I knew who was my verie [Ma]stre and Lord, the least displeasure, but [that] I had a thousand weight of comfort furthwith f[ollow]eng. Wherefore, what cause I have to have s[uch] confidence of His like goodness in all that may h[app]en the time to come your ladyship may hereby s[ee]. So that if you woll enjoy in me any part of that comfort God sendeth, the readiest way is, putting all care aside of me, let my Master and me alone; I mean this, not intermit the least care of mind for me, knowing to what master you have given me; but both touching yourself and me both, commit all to His goodness, as I doubt not your ladyship will, and shall be to me the greatest comfort I can have of you. Here is Margaret’s reply to the above letter from her son. It is noted that this letter appears to be a copy. Son Reginald,” I send you God’s blessing and mine, though my trust to have comfort in you is turned to sorrow. Alas that I, for your folly, should receive from my sovereign lord “such message as I have late done by your brother.” To me as a woman, his Highness has shown such mercy and pity as I could never deserve, but that I trusted my children’s services would express my duty. And now, to see you in his Grace’s indignation,—”trust me, Reginald, there went never the death of thy father or of any child so nigh my heart.” Upon my blessing I charge thee to take another way and serve our master, as thy duty is, unless thou wilt be the confusion of thy mother. You write of a promise made by you to God,—”Son, that was to serve God and thy prince, whom if thou do not serve with all thy wit, with all thy power, I know thou can not please God. For who hath brought you up and maintained you to learning but his Highness?” Will pray God to give him grace to serve his prince truly or else to take him to his mercy. Letters between Reginald and Margaret: ‘Henry VIII: July 1536, 11-15’, in Letters and Papers, Foreign and Domestic, Henry VIII, Volume 11, July-December 1536, ed. James Gairdner (London, 1888), pp. 30-45. British History Online http://www.british-history.ac.uk/letters-papers-hen8/vol11/pp30-45 [accessed 19 August 2016].